The London Show is now just days away and we hope to meet lots of our website followers at the event. We may be crazy but we are hoping we can find a way to take this magnificent plant to London on Sunday for the show that starts with the preview evening on Monday. 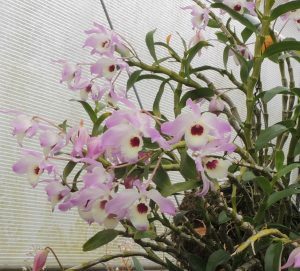 Dendrobium nolile is one of our favourite species. 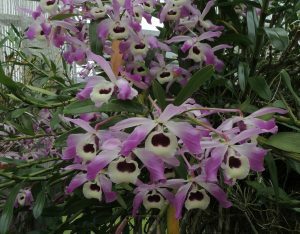 Its large and striking flowers are as arresting in the greenhouse as they are in the forests of Sikkim where it is the state flower. 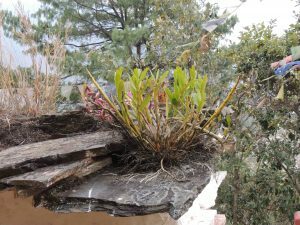 The plant here flowering near Gangtok in Sikkim shows the natural growth habit. The plant grows long upright pseudobulbs during the warm wet summer months. In their second year these bulbs become less upright and produce heavy flowering in April. 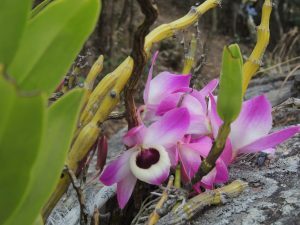 In their third year the bulbs are pendulous and produce a few extra flowers and by this time they have lost all their leaves. 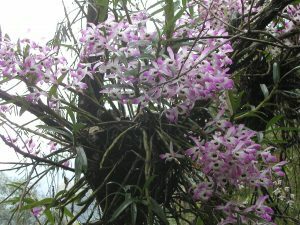 The wild plants in Sikkim show a wide range of colour forms and one tree in particular demonstrated the variability of the species with dark forms, light forms, rounded flowers and more pointed flowers. 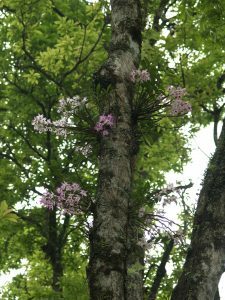 (see below) The tree also shows the habitat clearly with plants growing in dappled shade from tall trees and a little moss on the trunk showing that the dry season is far from bone dry here. In fact we found that it rains every few days in the dry season at this altitude 1200m. 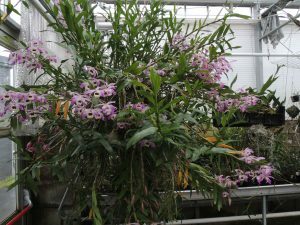 In cultivation we grow the species in Cool Asia with a minimum of 10C in winter and vents open above 17C. We keep the plants wet in summer and damp in winter, never allowing bulbs to shrivel. We have diverse clones in flower in the greenhouse too and this light form (below) will also be going to London this weekend.